Harness the power of agricultural drones to gain unprecedented, actionable intelligence that will help you quickly and efficiently monitor, collect and analyze data for crops, field conditions and livestock tracking. Observe conditions frequently and add to your precision agriculture objectives to improve yield and consistency. Imagine if your day started like this. You wake up at the crack of dawn, grab your coffee and your iPad. 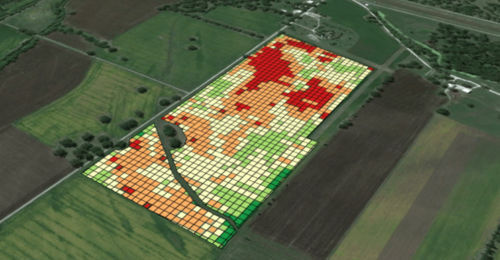 As you sip your coffee, you review heat maps of your crops taken the day before from your specialized farm drone. You spot a small area that you want to investigate for pests and you see that overall moisture readings are pretty good, so you decide to reduce water usage today. Also, because your go-to guy didn’t have to do a walkabout yesterday to manually inspect the crops, he had time to fix the combine in time for harvest. In less time than it takes to finish your coffee, you’ve already updated your day’s work plan for maximum productivity. Image and data collecting Drones with related applications to guide and automate flight routines. High-resolution Cameras designed for visible, thermal and multi-spectral ranges. Data collection and analysis software to provide timely reporting. Water-resistant Spraying Drones offer cost-effective precision application of liquids for pests, fertilizing and herbicides. (DJI’s Agras MG-1 carries a 10 kg liquids tank with a flight spraying rate covering 7-10 acres/hour through 4 nozzles, 10,000 M2 per flight, flight memory and terrain-following radar). The technology is smart, powerful and cost-effective. However, beyond the technology, there are many steps to put the overall solution together to successfully achieve real results on your farm. FarmTech Solutions provides you with dedicated service to identify opportunities, recommend the right solution for your objectives, review the operating details, get you up and running, and provide you with ongoing support and maintenance. We coordinate with our industry-leading drone applications partners to provide the specialized technology and maintenance support. You choose your preferred level of services, from supply-only, all the way through onsite deployment, ongoing remote support and technology upgrade programs.